The reliable MacTurn Series maximizes machining uptime by virtually eliminating fixtures and providing the broadest range of machining functions of any Okuma CNC machine in its chuck class. 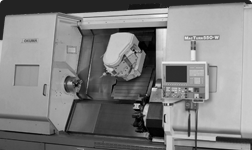 Okuma’s exclusive THINC-OSP control, a lower live turret, automatic tool changers with large tool holding capacities and available 9-axis machining and turning are just a few reasons why MacTurn multifunction machining centers keep you making more chips and money on every job. Add optional Collision Avoidance System, Thermo Friendly Concept and Machine NAVI for even greater productivity. Quick multitasking horizontal lathe in the 12-18 chuck class.